Official pronouncements that give glowing accounts of the economy overlook significant emerging problems. Recent statements on the external trade performance give the impression that the balance of trade is becoming more favourable. The plain truth is that the deceleration of import expenditure in May is not good reason to be optimistic about the external trade situation. It hardly provides a basis to expect an improvement in the trade balance during the rest of the year. The trade performance for May and the first five months of the year gives the impression that the country’s external trade is faring well. As a matter of fact, the country is heading for another massive trade deficit this year as well. Despite the deceleration in imports in May, there is a widening of the trade deficit by 2.1 per cent in May this year compared to May of last year and the trade deficit for the five months of this year expanded by almost 25per cent to US$ 4,184 million compared to a trade deficit of US$ 3,356 million in the first five months of last year. The declining trend in exports could widen the trade deficit still further. The latest Central Bank statement on the external finances has focused on the deceleration of imports. It has attributed this reduction of imports to the policy changes taken earlier this year. The monetary, fiscal and other measures, including the depreciation of the currency, it is correctly argued, have reduced imports in May. This reduction in import expenditure is most welcome. However, the deceleration in exports is far more than the deceleration in imports. As a result, there is a widening of the country’s trade deficit in May this year and in the first five months of the year. The decline in export earnings in the first five months of this year is more than the decrease in import expenditure. Therefore, the decrease in imports has been inadequate to offset the decline in export earnings. Consequently the trade deficit is expanding rather than contracting. 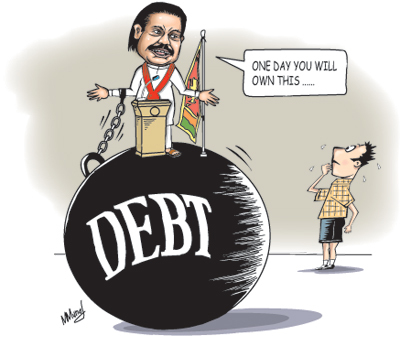 In May alone the trade deficit was US$ 865 million. Though lower than in the previous four months, if the trade deficit continues at this rate, the annual trade deficit would exceed US$ 10 billion. The imbalance in the country’s trade is aggravating as the import deceleration has been offset by decreased exports. The poor export performance this year is disconcerting. The export figures for May are especially disappointing as earnings from exports declined by 15.1 per cent to US$ 710 million. The export performance in the first five months is also disappointing as exports have fallen by 5.4 per cent and there is a progressive deterioration in export earnings. The decrease in exports in May by 15 per cent was due to both industrial as well as agricultural exports having fared badly. Agricultural export earnings declined by 11.5 per cent and industrial exports decreased by 16.2 in May this year compared to May last year. Export earnings during the first five months declined by 5.4 per cent. The decrease in agricultural exports was 11.8 per cent, mainly due to a decline of 10.8 per cent in tea export earnings. Industrial exports declined by 6.6 per cent reflecting a 4.9 per cent decline in earnings from textiles and garments exports that are the country’s largest export earner. 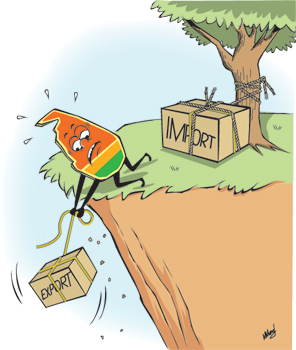 The decreasing trend of export earnings may continue owing to the slack international demand for the country’s exports. The country’s main industrial export is facing a severe downturn. Garments exports have been decreasing progressively in the five months of this year. Garments exports fell from US$ 367 million in January to US$ 278 million in May. This decline of 24 per cent in the country’s main export is alarming. Its continuous decline would reduce employment opportunities and incomes. The declining exports this year is a serious concern not only for the balance of trade and balance of payments but the country’s economic growth. While agricultural exports would revive with improved weather conditions and an improvement in global demand, the prospects for industrial exports are uncertain. The decline in exports that the country is experiencing this year would be a major factor in depressing economic growth. The impact of the drought would have much lesser consequence on economic growth though severe hardships are being felt by rural communities. It is likely that there would be a certain amount of catching up in agricultural production. Although the loss of crops and the reduction in agricultural output would affect a significant proportion of the rural population, as agriculture’s contribution is less than12 per cent to GDP it would have a minimal impact. Besides, fishery production and livestock production are likely to boost the agricultural sector. 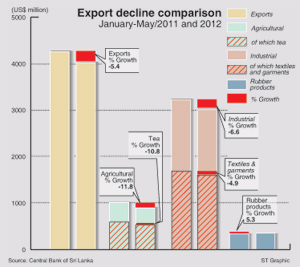 However agriculture may not generate growth this year.Sri Lanka’s main agricultural export, tea, has suffered on two counts. The adverse weather conditions have affected the production. It is estimated that this year’s annual tea production would be around 315 million kilograms, a drop of 5 per cent from last year’s crop of 330 million kilograms. This shortfall was compounded by dislocation of the country’s traditional tea markets and the depressed international prices for tea. Earnings from tea in the first five months amounted to US$ 530 million compared to tea earnings of US$ 594 in the first five months of last year. Agricultural exports declined by 11.5 per cent to US dollars 174 million, reflecting lower prices in the international market for the country’s main agricultural exports, tea and rubber; However, earnings from the export of cinnamon, pepper, cereals and fruit increased in May 2012. These gains were too little to compensate for the loss in tea export earnings. Global prices of some major commodities were mainly responsible for the lower earnings from industrial and agricultural exports. This trend is likely to continue. Hence, it is most important to restrain import expenditure. The reduction of imports is the short term strategy that could save the country from a balance of payments crisis. In the long run, the country’s economic growth would depend on a robust growth of exports. It has been pointed out that the country’s exports as a share of GDP has declined to as low as 17 per cent of GDP. Its share of world trade has also shrunk. It is imperative that the country expands its exports to achieve a healthy balance of payments position and to generate higher growth. For this there should be incentives and a healthy investment climate. The lack of these is hampering economic growth. This deterioration in export performance has broader implications than widening the trade deficit and straining the balance of payments. It has repercussions on economic growth, employment and incomes and could setback the country’s industrial development and growth trajectory. The declining export performance, especially of industrial exports, is worrisome. The declining exports this year should be the focus of attention rather than the reduced imports.